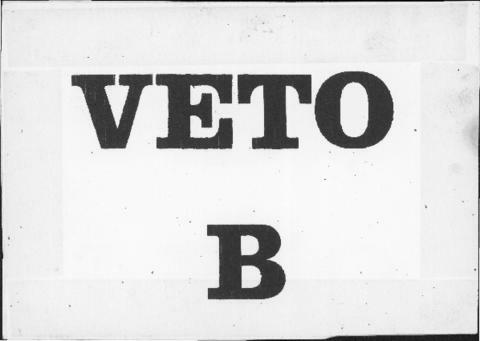 Item is a flashcard with the text "VETO B" on both sides. It is used in conjunction with flashcards "VETO A" and "VETO C" in parts 1 and 7 of the composition to interrupt the normal flow of the music. When the conductor implements VETO B, the orchestra switches to "dissipating gestures," which are represented on the score for parts 1 and 7 by graphic notation showing nine arrows pointing away from a central black dot.